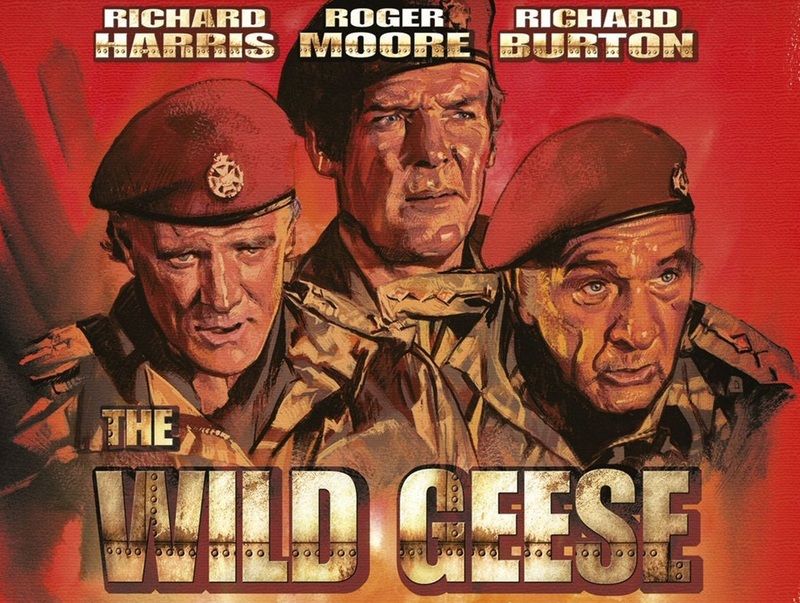 Monday sees the Blu-Ray release of perhaps the last great British action film, The Wild Geese. 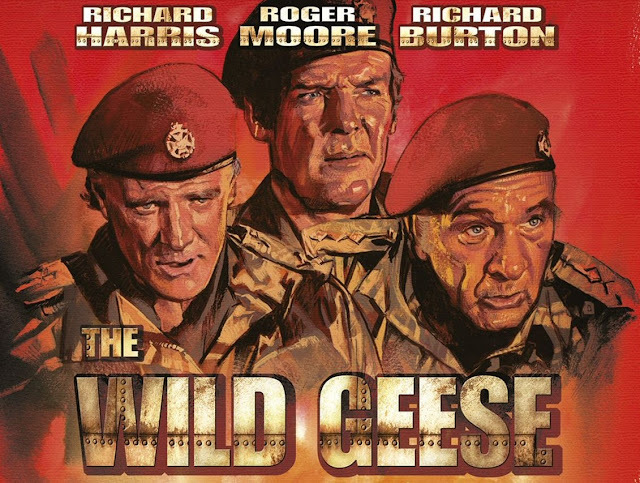 Starring Richard Burton, Roger Moore, Richard Harris and countless familiar faces from film and television, The Wild Geese can only be described as a complete classic. A wealthy British industrialist hires a crack group of mercenaries to travel to the wilderness of Africa and rescue a deposed political leader from a heavily guarded prison. However, the group leader Col. Allen Faulkner (Richard Burton) soon discovers that the threats do not simply lie in the war torn African nation but in the corridors of power back home. From the onset of The Wild Geese we are immediately struck by the Britishness of it all – from Faulkner’s Harry Palmer esque meetings with shady industrialists to Moore’s Lt. Shawn Flynn’s drug busts on swinging London clubs. The Wild Geese is a film chock full of atmosphere – whether it be from the gloomy darkened urban streets in the UK to the untamed wilderness of Africa, this is a visually rich tale – and what better way to compliment the classic home-grown feel of The Wild Geese than to cast some stellar British (and German) acting giants? It is this round up the mercenaries in the first act that proves to one of the key highlights of The Wild Geese. Held together by the fearless Col. Faulkner (Burton), old pals Capt. Janders (Harris) and Lt. Flynn (Moore) are soon rounded up. This is followed by appearances of classic thesps Kenneth Griffith (as scene stealing medic, Queenie), Hardy Kruger and Ronald Fraser. Seeing the group of mercenaries “team up” builds the integral sense of camaraderie that runs through the heart of The Wild Geese, whilst also providing the viewer with a chance to see these acting icons have some fun. The Wild Geese feels like a classic boys own adventure, taking on classic romanticised notions of the British empire. Andrew V. McLaglen (The Sea Wolves) directs this like a classic war film, but with some refreshing modern twists – most notably giving the film a gritty realism with more violence and bad language. After all being a mercenary isn’t going to be all smiles is it? This gritty modern take also fuses with the classic British feel of The Wild Geese for some unforgettable results. Most notably the introduction to Moore’s character where we see him take on a drug dealers, stating: “You boys are pushing bad stuff!” then forces one to eat a bag full of coke – this is action done British style. The African based action sequences prove equally as gripping as the portrayal of the British crime scene. Starting with a tense air drop sequence and a raid on a renegade camp it becomes clear that McLaglen and editor John Glen (director of several James Bond features) have a keen eye for the action film. A personal favourite sequence sees Hardy Kruger’s Lt. Coetze take out a barrage of guards with a crossbow – this gives Kruger a very welcome chance to shine. To further improve this seminal classic, Arrow Video have remastered The Wild Geese to perfection for the Blu-Ray release, which truly looks magnificent. As a further bonus, there is also a copy of Code Name: Wild Geese (an Italian near-remake of the film) starring Lewis Collins, Lee Van Cleef, Ernest Borgnine and Klaus Kinski included on the disc. The Wild Geese is one of the all time great British war movies and somewhat of last hurrah for the genre. Burton, Moore and Harris prove themselves to be unparalleled cinematic icons and it is a joy to watch them do what they do best in this unforgettable classic. You can buy The Wild Geese BR on Amazon UK.